Gov. Pakarathorn Thienchai talks with a family during this year’s visitation day for inmates’ close relatives at Chonburi Central Prison. 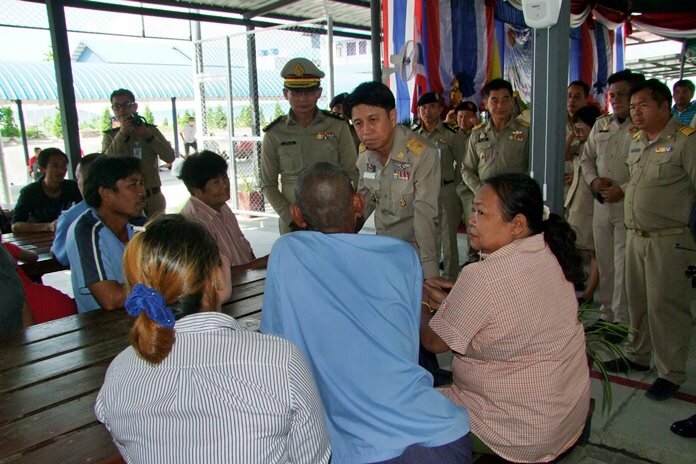 Chonburi Central Prison hosted a visitation day for inmates’ close relatives. Gov. Pakarathorn Thienchai opened the March 19 event at the Ban Bung District penitentiary, which allowed immediate family members to spend time with their incarcerated relatives from March 19-23 and 26-30. Prison warden Paitoon Ampan said the visits were open to prisoners who have exhibited good behavior. Only 1,631 of the 6,497 inmates – 25 percent – qualified. Paitoon said 7,000 relatives requested visits. The family members were given information on education, mental health, vocational training and career advice to give to their family members to encourage them to be useful members of society when they are released. Pakarathorn said the family visits were good for the inmates’ morale and aided in their rehabilitation and post-prison life.